Marlo Thomas is an American actress and television producer known to have pioneered the production of shows focused on a working-class single woman in Hollywood. She did so by playing the award-winning role of Ann Marie in the sitcom That Girl (1966-1971). Thomas has since moved on to become a published author and social activist who champions women’s rights and partakes in numerous charity works. Join us as we take a look at all her achievements, personal life, and earnings. Marlo Thomas was born Margaret Julia Thomas, the eldest of four children to Rose Marie Cassaniti and comedian Danny Thomas. Her birth took place on the 21st of November 1937 in Detroit, Michigan. Due to her father’s career, the Thomas family moved to Beverly Hills, California, where they raised their daughter. She attended Marymount High School and the University of Southern California where she was a member of the Kappa Alpha Theta sorority before graduating with a teaching degree. In 1960, Thomas made her acting debut in an episode of The Many Loves of Dobie Gillis before going ahead to appear in shows like 77 Sunset Strip (1960), Thriller (1961), and The Joey Bishop Show (1961-1962). In 1965, Thomas appeared in the pilot episode of the ABC show Two’s Company which was not picked up. Her performance in the pilot, however, caught the eye of ABC executives who gave her the chance to come up with her own show in which she would play the main character. That opportunity led to the creation of the sitcom That Girl (1966-1971), where Thomas played the main character, Ann Marie. Her performances on the show earned her a Golden Globe Award for Best Actress on Television in 1967 and several nominations including a Primetime Emmy Award for Outstanding Lead Actress in a Comedy Series before she chose to end the series in 1971. Marlo Thomas’ next major roles were as Tess Lynd in Consenting Adult (1985), which earned her Golden Globe Award nomination, and then as Marie Balter in Nobody’s Child (1986), where her performance earned her a Primetime Emmy Award. Other noteworthy roles that came after that were in films and series like Friends (1996-2002) where she played Jennifer Aniston’s mother, Sandra Green, Deceit (2004), and LOL (2012) alongside Demi Moore and Miley Cyrus, among many others. Marlo Thomas has reportedly gone under the knife on multiple occasions to get a nose job, eyebrow lift, facelift, and filler injections. Many people have come out to criticize her for this because the apparent work seems badly done and obvious to the naked eye as it makes her look artificial. However, this seemingly has not made her change her mind about getting the next thing done on her body. Marlo Thomas is estimated to have a net worth of around $35 million. The award-winning actress is also a recipient of the highest honour an American civilian can receive – the Presidential Medal of Freedom, awarded to her by President Barack Obama in November 2014. She made her wealth through her career in Hollywood, as well as authoring books. She has published seven best-selling books, three of which were number one. It is not clear if Thomas makes any money from her role as the National Outreach Director for St. Jude Children’s Research Hospital, the pediatric and research facility that was founded by her father in 1962. In the late 1960s and early 1970s, Marlo Thomas was in a well-publicized relationship with playwright Herb Gardner. Nothing was eventually made out of the relationship as Thomas went ahead to marry media personality and talk show host, Phil Donahue. 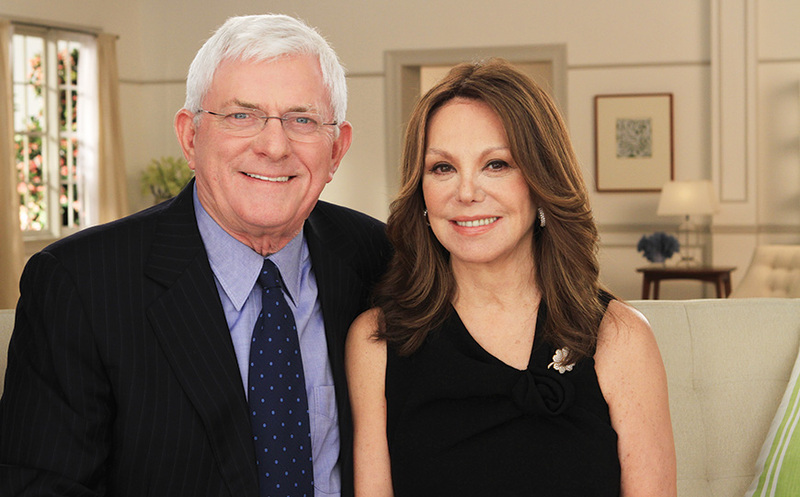 Thomas met Donahue for the first time in 1977 when she appeared on his show, The Phil Donahue Show. The two were said to have experienced love at first sight which kicked off a three-year relationship that led to them exchanging vows on the 21st of May, 1980. She subsequently became a mother figure to Donahue’s five children, which he had from his first marriage, as the couple did not have any children of their own. Marlo Thomas is still very much alive as she has in recent times, taken up a few minor acting roles. In 2015, she appeared in an episode of Ballers and two years later, she appeared in the web series Wet Hot American Summer: Ten Years Later and film The Female Brain (2017). In 2018, Thomas resurfaced in the acting scene again by taking up a minor role in the film Ocean’s 8.